Skiing games have been fairly popular in Europe in recent years, but not many of them have made it over to North America. But Merscom has decided to bring over Bode Miller Alpine Skiing, hoping to tie in with the success of said athlete. Although the game will appeal to a niche audience, that audience will certainly be pleased with this title. One thing that separates Bode Miller’s title from others in the genre is the use of RPG like elements. Players will spend most of their time in the Career mode, where they take a skier from the rookie circuits all the way up to notoriety. In between races, you can buy new equipment, train your skier (to upgrade their stats), and edit wax settings (to help you stick to the track). In addition to this, players can also negotiate various sponsorships and manage their calendar of events. This Career mode is very in depth and simulates what the pros most likely go through every season, and fans will absolutely love it. If you’re not into all of the in depth features that the robust Career mode offers, there is still plenty more to do in the game. For those people that aren’t as into the simulation side of things, there is an Arcade and Practice mode that let you get right into the action without having to worry about statistics. Controlling your skier is fairly simple, and depends on the use of the directional keys. The game is fairly easy to get into, allowing players the chance to get used to the gameplay before jumping into a lengthy career file. In addition to that, it is possible to play with up to 12 players via Hot Seat or LAN, which will prove to be a fun diversion. A well put together presentation is a must for any sports game, and Bode Miller Alpine Skiing does a competent job in this regard. Graphically the game looks pretty good, although it is not without a few quirks. The environments look pretty nice and pack a fair amount of detail, although at times one can notice somewhat boxy looking foliage and other background details. It would’ve been nice to see these pack a bit more detail, but the minimal system requirements make up for it (even if your PC isn’t gaming oriented, you should be able to run this well). The skiers themselves are well modeled, although the interaction of the skis and the terrain could have used a bit of improvement. But in the end, the sense of speed more than makes up for it, as the developers absolutely nailed it. Players will really feel as though they are flying down the mountains at high speed, and this title definitely has the best sense of speed in the genre. In an attempt to give the game a network style presentation, the developers included video replays, statistic lists, and commentary. The video replays look nice and definitely replicate what one would see on say ESPN, as do the statistics lists. The commentary doesn’t fare quite as well (they don’t always sound particularly interested in what is going on), but it does add a little to the presentation. Aside from the commentary, the sound is about what one would expect (competent sound effects with no real background music). 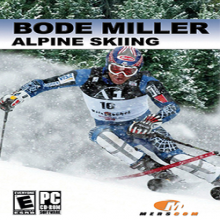 Bode Miller Alpine Skiing is a well put together skiing game at an affordable price ($19.99). However, the Arcade segments of the game will only prove enjoyable for so long. Those gamers who actually take the time to try out all of the intricacies of the Career mode will find a worthy purchase, while casual fans will want to check it out first before committing. But if you’re in the market for a skiing game on the PC, this is the one to get.